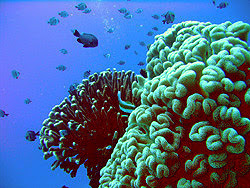 DIMPLE (B)- This is a seamount on the Western side of Saipan. Entering the water you will see a large school of Red Snappers in the distance, towards the base you will find hundreds butterfly fish. 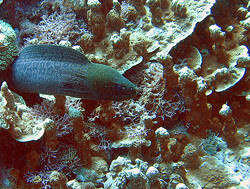 Eagle Rays, Eels, and Surgeons are also seen often. Depth on this dive ranges from 40 feet to 130 feet making it suitable for all skill levels.